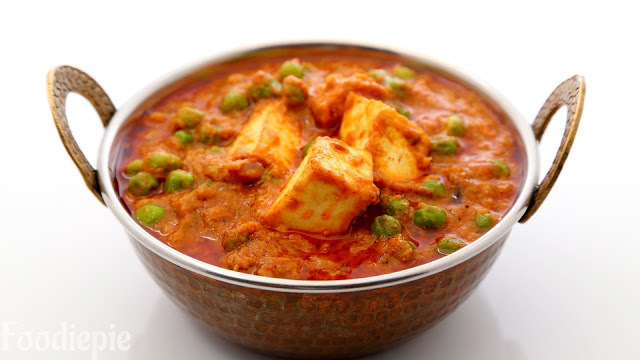 Matar Paneer Recipe - Mutter Paneer Recipe is one of the main dish of North India. This is liked in every home.This is delicious combination of Soft paneer and Green Peas.This is simple recipe you can prepare it in minutes. You can serve Matar Paneer with Naan, Paratha or plain or jera rice Taste goes well.The paneer cubes brings well taste and cashews nuts paste give rich and creamy texture.This is suitable for lunch or dinner.Let's checkout recipe first. Step 1 : Grind tomatoes,Green chilies,ginger in small grinder jar make a paste then add cream and grind once again for seconds.Grind cashews nuts in other jar or clean same jar before grinding cashew nuts. Step 2 : Cut the paneer into square pieces and boil the peas with half cup of water. Step 3 : Heat oil in pan and add Cumin(jeera) saute until Cumin seed get crackled then add turmeric,coriander powder, chilli powder, roast it with a spoon for 3-4 minutes.Then add cashews nuts paste.Saute again for 1/2 minutes. Step 4 : Now add paste in it which we prepared in 1 step.Saute until oil starts separate it will take around 7/8 over medium flame. Step 5 : Now add as much water as you want, Gravy thicker, according to you. Put boiled peas and salt in the pan and allow it for 1 boil. Step 6 : After boiling, add paneer and boil for 3-4 minutes. Step 7 : Add garam masala and chopped green coriander leaves.Cook for 1 minute over Low flame and turn off the flame. Step 8 : Transfer to serving bowl Matar Paneer Recipe is ready and garnish with coriander leaves and serve with Naan, Paratha, plain chapati or Fried rice.